Does your line of work require you to often provide multiple copies of the same forms? 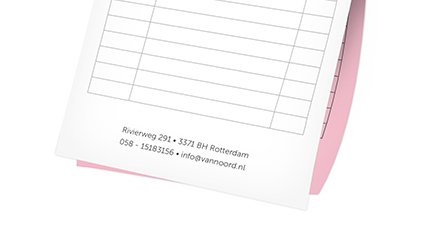 Our NCR duplicate copy pads are for you. Keep hold of the original whilst providing your customers with a copy of delivery notes, bills of laden, application forms or product orders. Available to print from 1000 sets, our NCR slips are printed on 80gsm paper. Each set consists of 2 sheets, with the 1st sheet white, 2nd sheet of variable colour. They bound on the short edge. FREE standard delivery on all our NCR duplicates with NO minimum order. NCR Pad Design Need Artwork?